"An Imperial Oatmeal Stout brewed with cocoa and molasses. A slight bitterness from the cocoa is noticeable, but yields to the overall sweet profile of this beer. Allow it to warm, and the full spectrum of flavor is revealed. The mystery is how we managed to pack so many flavors into one beer!" This stout pours midnight black with a one finger off white head. Some lacing is left behind. The aroma is heavy on the roasted malt and coffee. There is also some hints of dark chocolate. This stout is quite a mouthful. It is very strong with coffee and dark bitter chocolate up front. It is fairly sweet with molasses and caramel notes. It has a full body with a creamy mouth feel, very nice! My overall impression is excellent! This is a fantastic imperial stout. It is heavy on the roasted malts and dark chocolate. With the mouth feel having some help from the oatmeal, this is one nice stout. 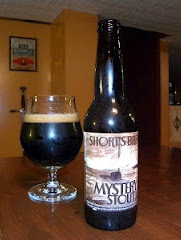 So far I have had great luck with Short's Brewery. I will continue to try their vast offerings when possible. I would rate this a 9 out of 10.